Topcroft is a small parish in the South Norfolk Local Government District, with an area of some 773 hectares. It contains the settlements of Topcroft and Topcroft Street, and is just 6km to the north of the Suffolk border. The name ‘Topcroft’ is thought to come from a hybrid of the Old Norse and Old English words for Topi’s croft. The earliest recorded monument are a number of ring ditches (NHER 36357) which are thought to be of Bronze Age date, and are situated within a complex of cropmarks which include undated enclosures and linear features. 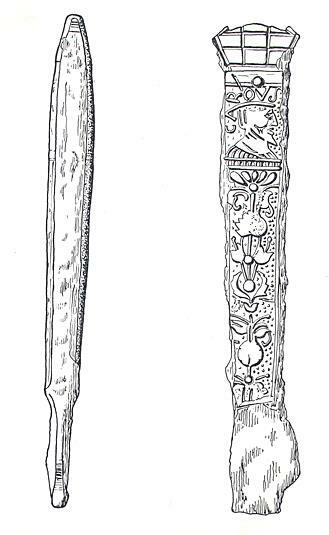 Only a very small number of prehistoric objects have been recorded, and these are limited to flint flakes (NHER 38091) and a Neolithic or Early Bronze Age scraper (NHER 19854). There are also a small number of Roman objects recovered from the parish, including pottery sherds (NHER 18437 and 19151), key and terret fragments (NHER 21859), a brooch (NHER 22629) and coins (NHER 28489 and 50026). It is also thought that there was a villa (NHER 10194) present in the parish in Roman times. Pottery sherds, roof and floor tile fragments have been recovered since 1959, as well as fragments of wall plaster and opus signinum, coins and brooches. Although no Saxon monuments have been recorded, a small number of objects have been noted. These comprise an Early Saxon brooch (NHER 28489), an Early or Middle Saxon pendant (NHER 32885), a Late Saxon stirrup fragment (NHER 42802), bird brooch fragment (NHER 39872) and a coin of king Cnut (NHER 36600). Despite the lack of recorded monuments, the Domesday Book’s listing of the settlement suggests that the area was both populous and valuable. The earliest extant building is therefore St Margaret’s Church (NHER 10214), which may contain work that dates back as early as the 11th century. Today the majority of the visible work in the church, which has a nave, south aisle, porch and west tower, dates to the 14th and 15th centuries. The brick chancel dates to 1712 and has a rare example of a consecration mark, and there are a number of medieval coffin slabs in the graveyard. In addition to this building, the site of four medieval moated enclosures are recorded (NHER 10195, 10205, 10206 and 20531), as well as the site of a chapel dedicated to St Giles or St Ethelbert (NHER 10197). Objects from the medieval period include pottery sherds from ten sites (NHER 18836, 20933 and 40965) and coins from eight sites (NHER 22629 and 42602). Other objects of interest include a 13th century medieval lead seal matrix (NHER 21860) and a buckle and strap fitting (NHER 20934). There have also been post medieval objects recovered, including pottery sherds (NHER 19151) and coins (NHER 50026). Six post medieval crucifix pendants have also been recovered from five different locations in the parish (NHER 10197, 32882, 32883, 32884 and 32885). These pendants are thought to be of identical design, though how and why they were deposited in the parish is unknown. A number of post medieval buildings of architectural interest have also been recorded. Perhaps the largest is Topcroft Hall (NHER 10196), a timber-framed early 16th century mansion with a first floor hall. Of similar date is Church Farmhouse and Colly Cot (NHER 10205), which were built in the late 16th century as a single property and stand within a medieval moated site. A number of interesting buildings can also be seen on The Street, including 17th century timber-frame and brick Topcroft Lodge (NHER 34094) and Little Manor (NHER 34097), which dates to around 1600 and has a thatched roof. Also of particular note is Street Farmhouse (NHER 34098) which dates to the late 16th or early 17th century, and has two three-light mullioned windows that have been reopened. World War Two also left its mark on the parish, and a pill box still survives today (NHER 32724). However the modern site of most interest is probable Airfield Farm (NHER 41780), which is thought to have been the site of a Cold War rocket test facility, although it was never finished.